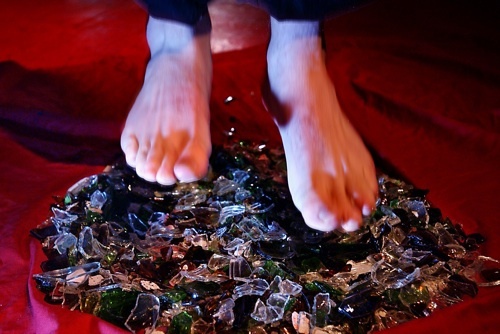 Everybody’s first reaction to barefoot running is the concern about broken glass. I’ve argued before that there’s just not that much of it out there. Well, I’ll soften my position slightly after my last couple of runs on which I’ve seen stuff that could cut a foot. Generally I run through suburban neighborhoods. I think I’ve literally never seen broken glass running in Lincoln which is rather rural. In Waltham, I’ve probably seen glass on one in four runs. Recently, though, I’ve upped my lunchtime mileage and have been running on a road in Waltham where I’ve seen glass. I didn’t come near to stepping on any, but I am now extra cautious on that road. The road in question is Lexington Street which is more of a road than I typically run on. It’s a two lane highway with a 35 or 40 mph speed limit and it runs through a mix of residences and strip malls. I’ve been paying some attention to similar roads, and I think they are worth extra caution. I guess people drop or throw bottles out of cars. And, unlike in a neighborhood where someone might clean up such a problem, there seems to be less of that on these types of roads. If there’s something unappealing about barefoot running, it’s that it really does require one to look down more than I’d like. Often when I find myself distracted from what’s in front of me, I end up stepping on a little stone or something. My advice is: Know your road. If it’s at all glass prone, be especially careful. This entry was posted on June 4, 2010 at 8:08 pm and is filed under Barefoot Running, Experience. You can subscribe via RSS 2.0 feed to this post's comments. You can comment below, or link to this permanent URL from your own site. Rich Zane, assistant head of emergency medicine at Brigham and Woman’s and my brothers best friend just stitched up a two inch gash on the sole of a barefoot runner from stepping on glass. Rich found it highly amusing that the runner was going on about the how humans are meant to run barefoot and running shoes are a giant conspiracy while on the table. Rich’s point to the runner was there is very little in common between the pre-historic African Sahara and the roads of suburban Boston. The VFF classic is your best bet to minimize the potential damage and still maintain the barefoot feel. 1. Are you or Dr. Zane aware of any studies showing a reduced rate of injury with VFF versus barefooting? 2. Are you aware that certain harmful bacteria, especially pseudomonas, are more effectively transmitted through footwear than through a bare foot? 3. Did you know that many habitual barefooters build up enough callus for some protection? 4. Would you be willing to bet that the majority of barefoot runners are able to use a modicum of common sense in avoiding obstacles, and perhaps as they get used to barefooting, have a heightened “pedal sensorium”, so to speak, and are more able to avoid hazards? 5. Did you know that cuts actually heal? I mean, it isn’t race car driving or scuba diving, or even bicycling without a helmet. It’s a foot boo-boo! I wouldn’t want one the week of a marathon, but otherwise I think I could live through it, considering all the other advantages. I think it’s sad that non-barefooters are so quick to form opinions about barefooting, and question whether it’s more a social taboo than a true danger concern. Show me the research, and by all means, use the VFF if you like. I’ll stay barefoot, thanks. Stan, Marta’s cool, just a VFF devotee. She swam with me Jan 2 on the Cape so she’s got that going for her.